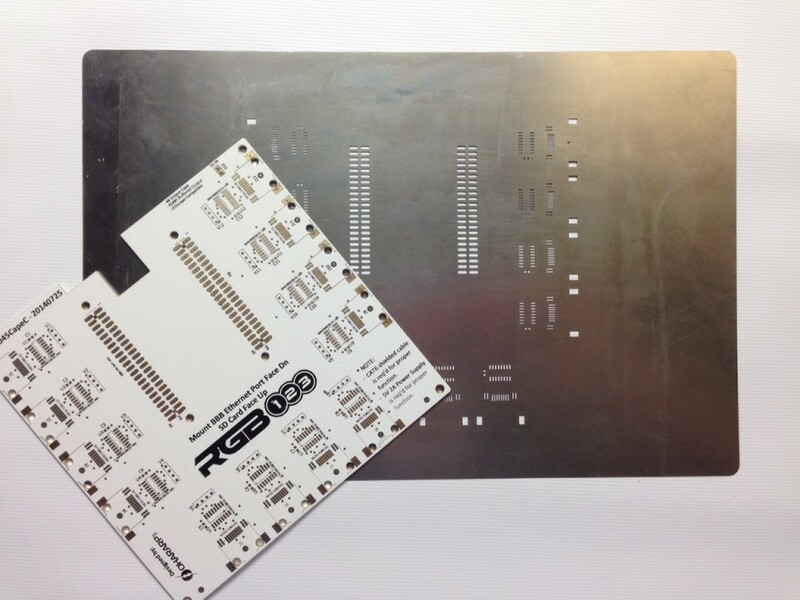 We are providing stainless steel stencils up to 17″ x 17″ x .004″ in size that are to be used in the production of prototype and short run printed circuit board designs with surface mount components. All stencils will be a minimum size of 4″x4″ and will have a 1″ border surrounding all SMT pads or the pcb outline of your board if it is provided. If you have a unique frame configuration please specify this to us in the notes section when you send your files and we will size the stencil appropriately. If you are placing an order for multiple stencils, we ask that you please add an item to your shopping cart for each stencil. When you do this you will need to add the appropriate size details and the individual .zip file containing the required gerber files (paste and outline) for the item. Submit your order and your stencil will ship within approximately 5 business. We are able to provide this service by “panelizing” multiple designs into a single panel and processing them at once. This service is similar to other batch services that are commonly used for pcbs. We understand that research and development of prototype designs can be expensive and have streamlined our order process to provide you with the lowest cost and highest quality stainless steel stencils available. We require that RS-274X gerber files include the board outline and cream/paste layers. For each stencil order please place all files in a single .zip file with no subdirectories. We have upgraded our laser capability to a system that uses advanced fibre laser technology and a precision gantry setup to handle any SMD stencil package. Your stencil will undergo review by engineers in a two-step review process. We will review your design and let you know if there are any problems before cutting. Homebasing, windowing, and pad swell will be performed by our engineers to ensure your stencil will work reliably for your prototype pcb.